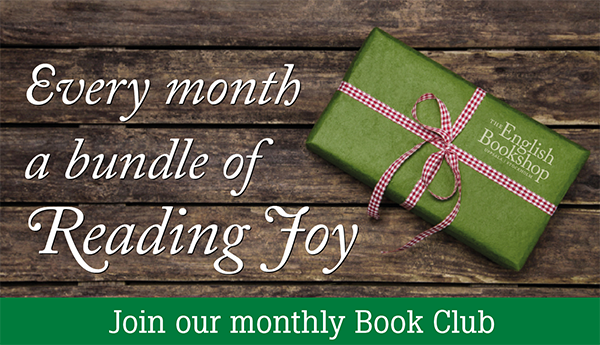 Join our Book Club and get a new book in the mail every month. It’s like Christmas all year round! All picks are made personally by us in the bookshop. Choose your favourite category (or categories) and we’ll send you a new wonderful surprise each month. You’ll get an invoice four times a year (you pay for 3 months at a time). Monthly fee is fixed and delivery is free. All categories are 150:-/month. What if I want to leave the club? No worries; you can unsubscribe at any time and you’re ­always welcome back later. Can I give a subscription as a gift to someone? Sure you can (and what a nice giver you are!). You can gift an on-going subscription, or time-limit it to 3, 6, 9, 12 months. What if I’ve already read the book? This sounds dangerous, like a literary Russian roulette! No need to worry, there’s no risk of bloodshed. The risk of discovering new favourite authors is higher though… We like to call it – literary serendipity! Howdy neighbour! Then we have another suggestion for you; drop by the shop and buy a Book Club Card! Each card is valid for 3 months worth of Book of the Month (or 3 books right off the bat). Get the card for the fiction categories, and you can choose freely from any of the nine fiction categories of the month. Or get the non-fiction card which lets you choose the non-fiction category as well. (Oh, and it’s the perfect gift for a friend living locally!). I don’t even live in Sweden! No need to worry, we’ll send you the book anywhere in the Nordic countries and rest of Europe for a slightly higher monthly fee, +SEK 50:-/book. Invoiced quarterly as usual. Enough talk already, how do I sign up? Fill in the form below, or talk to us in any of the shops. Mystery picks are crime and mystery novels, mostly British, often historical, never gory. Noir brings you the tougher and darker literary crime novels. Paranormal/Urban Fantasy, Fantasy and Sci-Fi categories! Here you will find new voices in alternate world writing. Teen and Young Adult for the young reader. Young in years, or young of heart. Classics are classics for a reason. (Re)discover the treasures of English classics. We will most often read the non-standard classics. Short Stories – collections of big stories in a small format. Perfect for the commute and busy schedule. Non-Fiction (History/Biographies) is the category for the investigative and curious mind. All book club categories are 150:-/month. Got a special message? Type it here!